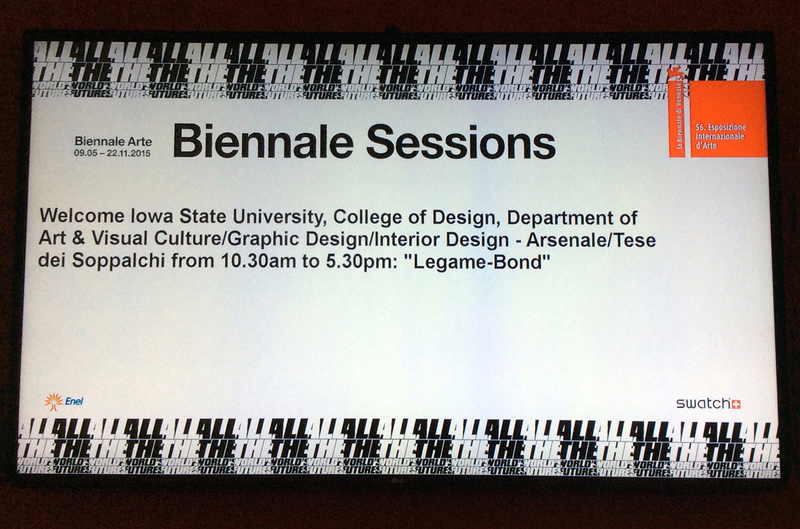 Iowa State University’s College of Design is one of only a few North American universities and art institutes to participate in the Venice Biennale Sessions in Venice, Italy. 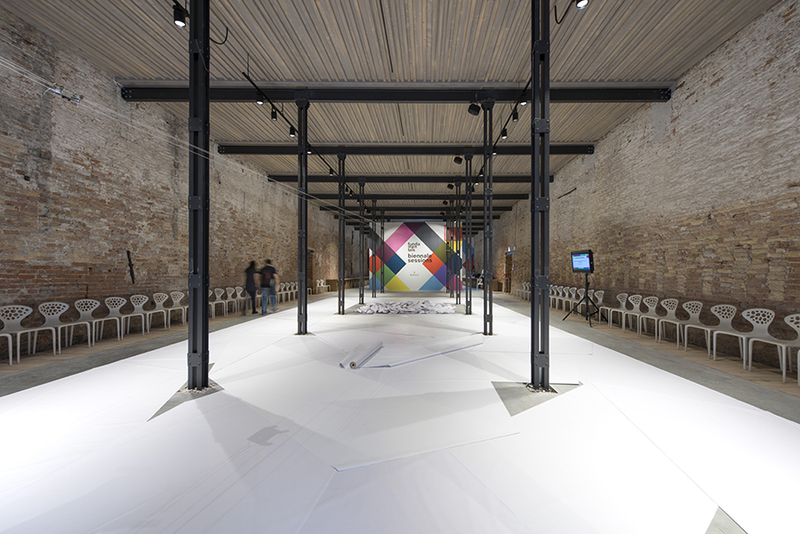 The Venice Biennale is one of the most famous and prestigious cultural exhibitions in the world. 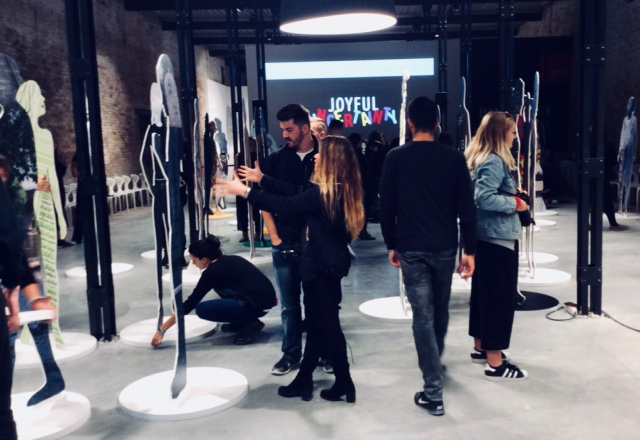 Thirty-eight Iowa State University students in graphic design, interior design and integrated studio arts who studied in Italy during the fall semester with the College of Design Rome Program developed an installation for the 2017 Venice Art Biennale. 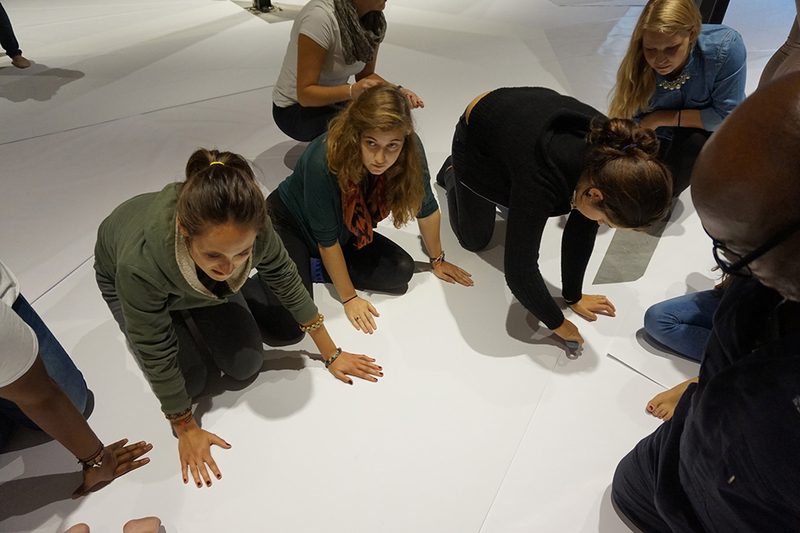 Titled “Joyful Uncertainty,” the Biennale Sessions Workshop addressed the tension the students experience between joyful anticipation and anxious uncertainty over what lies ahead on their journeys through an unpredictable world. The students created self-portraits using type and/or original imagery on larger-than-life-sized cutout silhouettes. 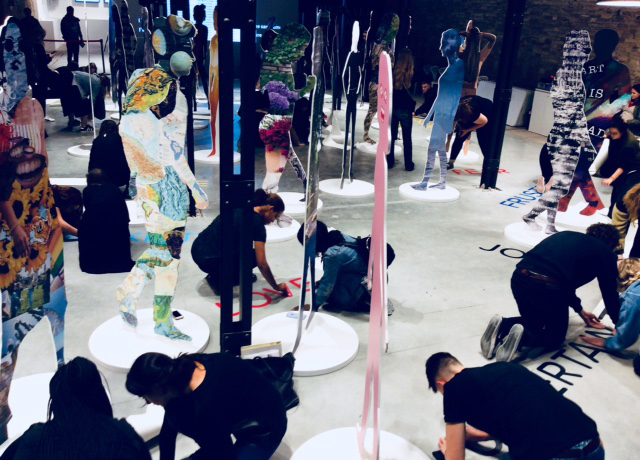 Each side represented the workshop title’s contrasting terms (joy and uncertainty) and the notion of Millennials as the “Me” generation (focus on the individual) that simultaneously creates community (focus on the collective) using social media networks. 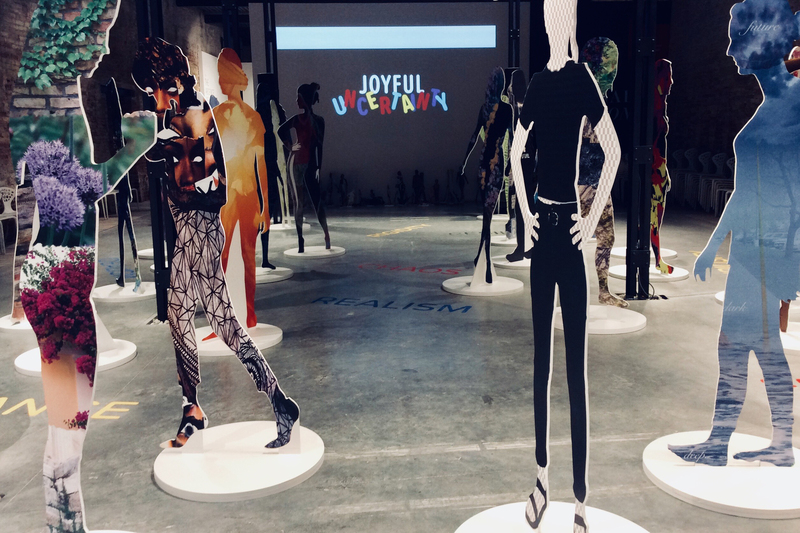 Displayed down the center of the Arsenale in Venice Oct. 19-21, these silhouettes established a diverse, collective cacophony of visual voices that demonstrated how Millennials share similar optimism and concern for the future with the generations that preceded them. Typographical elements on the floor served as stepping stones, creating a path that suggested both a separation and a reconciliation of the opposing concepts of joy and uncertainty. The project sought recognition and understanding from viewers to validate the students’ depictions of self and life’s journey, thereby uniting different generations via art. Instructors included Lee Cagley, professor and chair of the Department of Interior Design; Brenda Jones, University Professor of art and visual culture; Cheri Ure, senior lecturer in graphic design; Pia Schneider, Rome Program resident director; Simone Bove, instructor in interior design; and Claudia Campone. 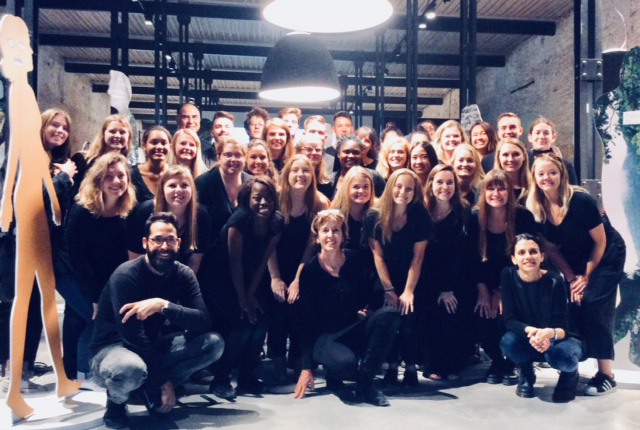 Three students and a faculty member from the University of Alabama at Birmingham also participated through the Association for the Arts in Research Universities (a2ru). 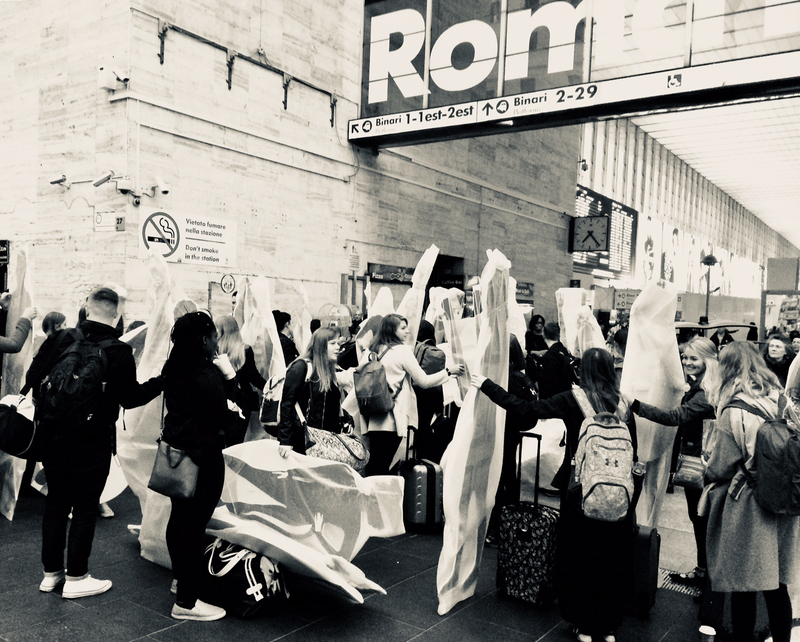 Thirty-two ISU students from architecture (29 of whom traveled from Ames and three of whom were already in Europe), 12 ISU interior design students who were studying in Italy during the fall with the College of Design Rome Program, and five students from the Roma Tre University Exchange Program. 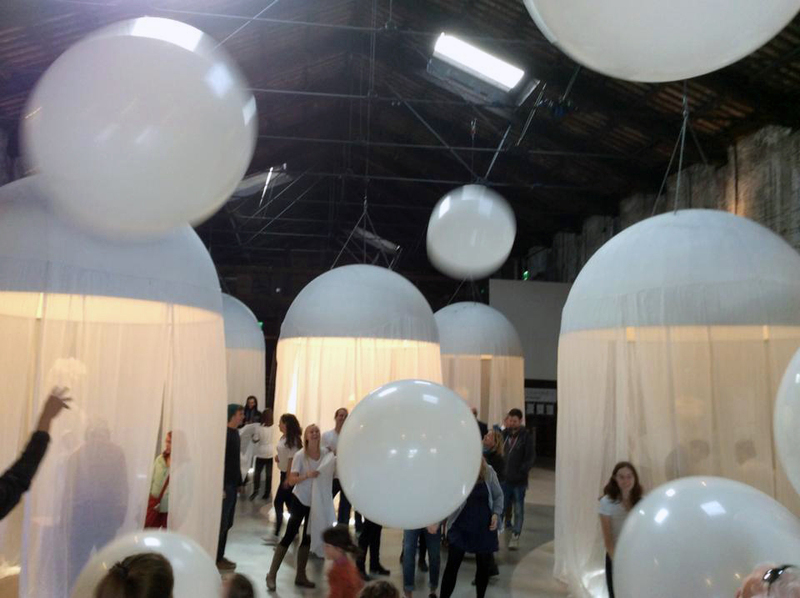 Students designed and fabricated temporary structures in Iowa and carried these fabrications to Venice for assembly and display at the Biennale. 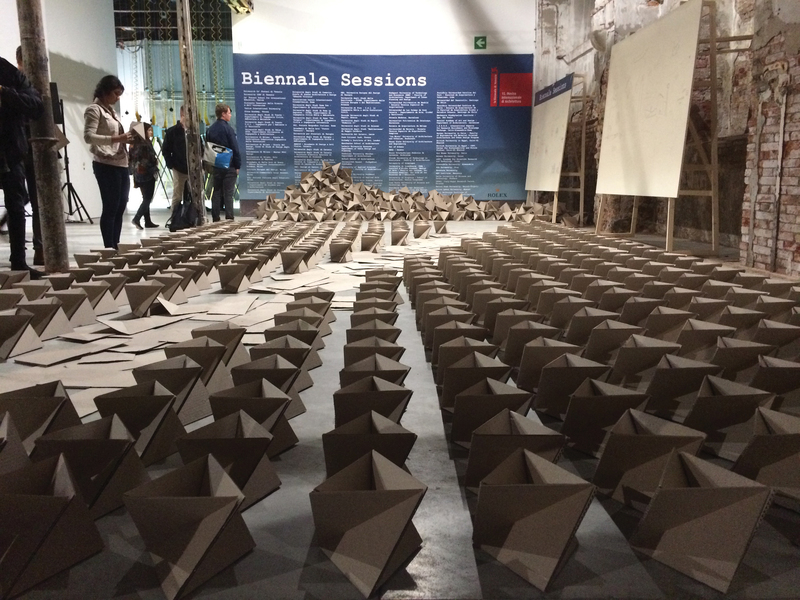 Disrupt/Displace is a critique, performance, and proposal that responds to 2016 Venice Biennale theme reporting from the front. The project was meant to begin a discussion of how spatial issues could have social consequences and how that translates to different geographies. The project was under supervision by instructors Shelby Doyle, Leslie Forehand, and Graduate Assistant Andrew Meyer. A booklet has been put together by the students describing the project’s formation. Click to view. Read more information about Disrupt/Displace. 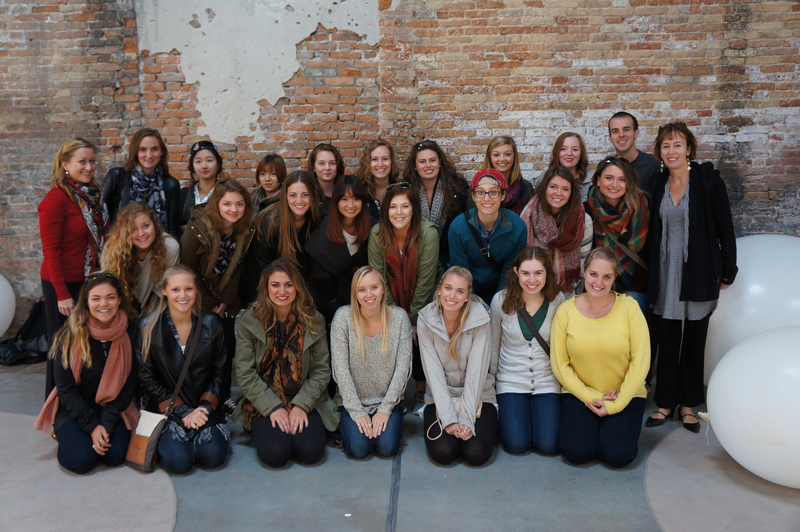 Forty-nine ISU students majoring in graphic design, interior design and integrated studio arts who studied in Italy with the College of Design Rome Program during the fall semester participated in a workshop and colloquium Oct. 22-24, at the Venice Biennale 2015, 56th International Art Exhibition. 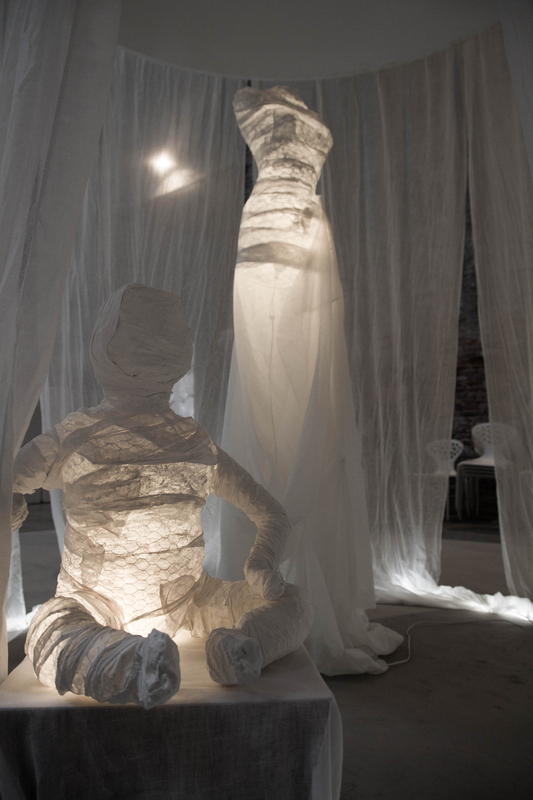 The students used gauze to address the theme of wounds and healing through exploration of the term “bond,” specifically, the bond between mothers and children in prison and the practice of separating women offenders from their newborn infants. 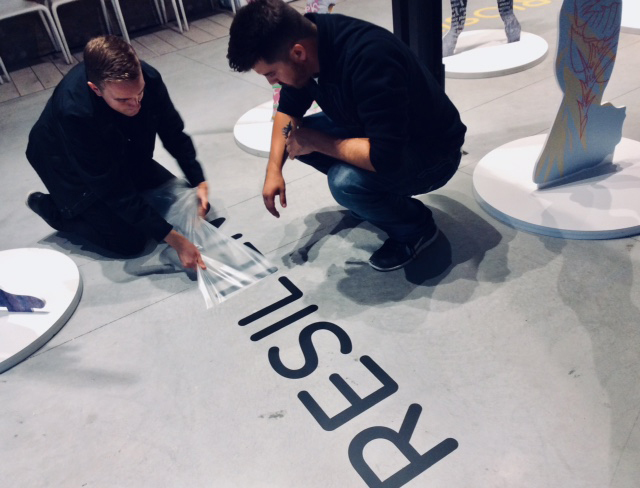 Read more about the Biennale installation in Inspire. 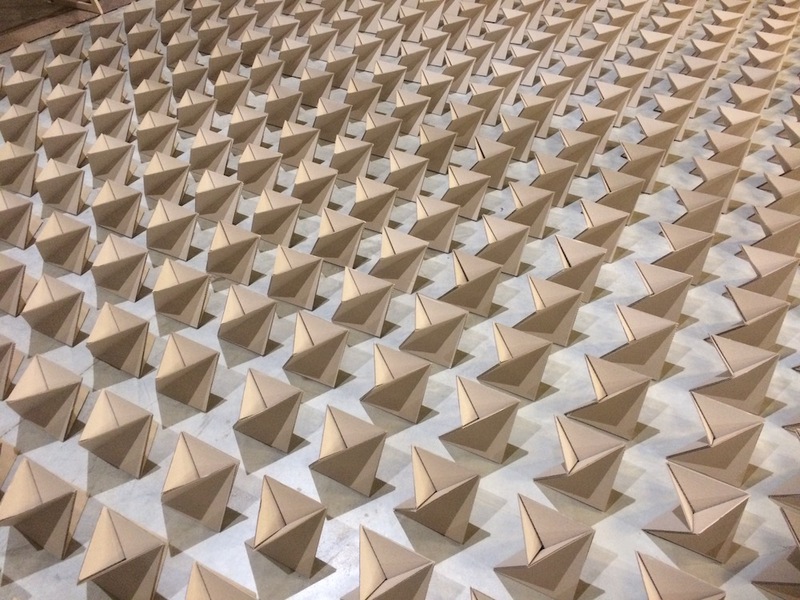 Fifty Iowa State University architecture and interior design students worked in small groups to generate assemblies of topographic surfaces that elevate the understandings of and actions upon the elemental surface of architecture at the 2014 Venice Biennale in Venice, Italy. The two day workshop, Caution Wet Floor: Slipping Into Deep was lead by Architecture faculty Cameron Campbell, Peter Goche and Mitchell Squire Oct. 16-17, 2014. Read more information about Caution Wet Floor.